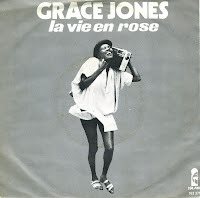 I bought this 7" single of Grace Jones' 'La vie en rose' long before I bought the 12" single. At the time, I felt it was just a nice song, but since then, I have grown to appreciate this track as one of Grace's best. Of course, 'La vie en rose' was a hit for French singer Edith Piaf first. Written by Piaf and Louis Gugliemi, her songwriting team did not think the song would be successful, but it turned out to be a favourite with audiences. The same goes for Grace Jones' version: it was released as a single in 1977 and 1982, and on both occasions it became a big hit in several countries.